TMC Fertility's in Malaysia success rates are documented and published in international medical journals as we continue to set new standards in fertility breakthroughs. Our fertility treatment in Malaysia success, is measured based on clinical pregnancies, as recommended by the Human Fertilization and Embryology Authority, UK. A clinical pregnancy is when the ultrasound scan has shown at least one fetal heartbeat. This is different from normal pregnancy rate using positive urine or blood test results, which may not be accurate due to the medications taken during the IVF treatment which disrupts hormonal levels in the bloodstream. Fresh IVF cycle means the eggs are collected, fertilised and typically a ‘fresh’ embryo is transferred into the patient. Our statistics show that the younger you are, the higher your chances of pregnancy success. 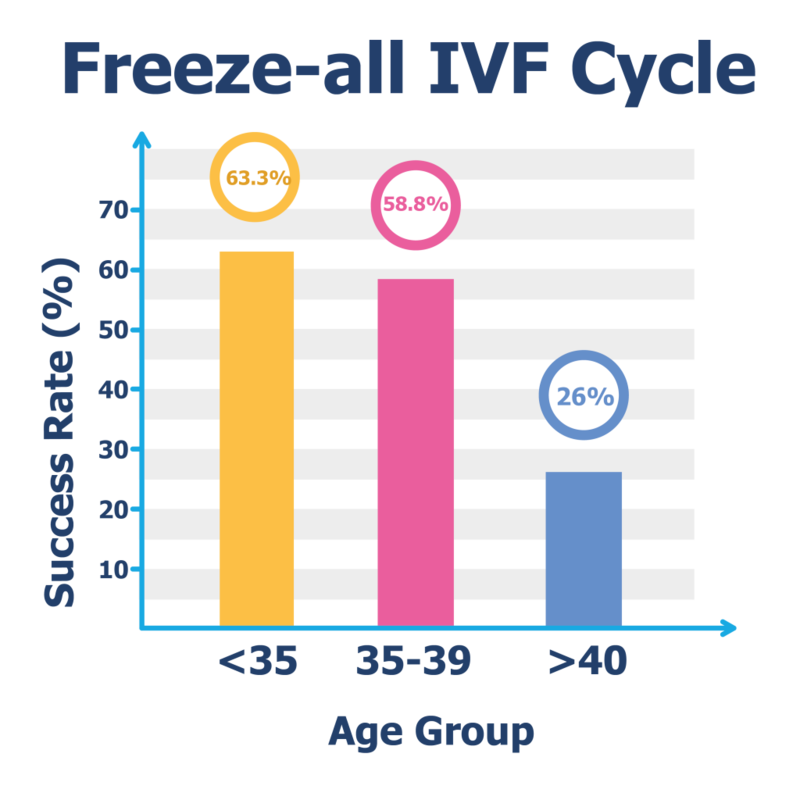 Freeze-all IVF cycle means that the embryos are frozen and thawed at a later date before being transferred into the patient. The pro of this cycle is that the body has time to recover to its normal state and embryo will get a fresher and more natural environment to grow when transferred. Our statistics show that the younger you are, the higher your chances of pregnancy success. 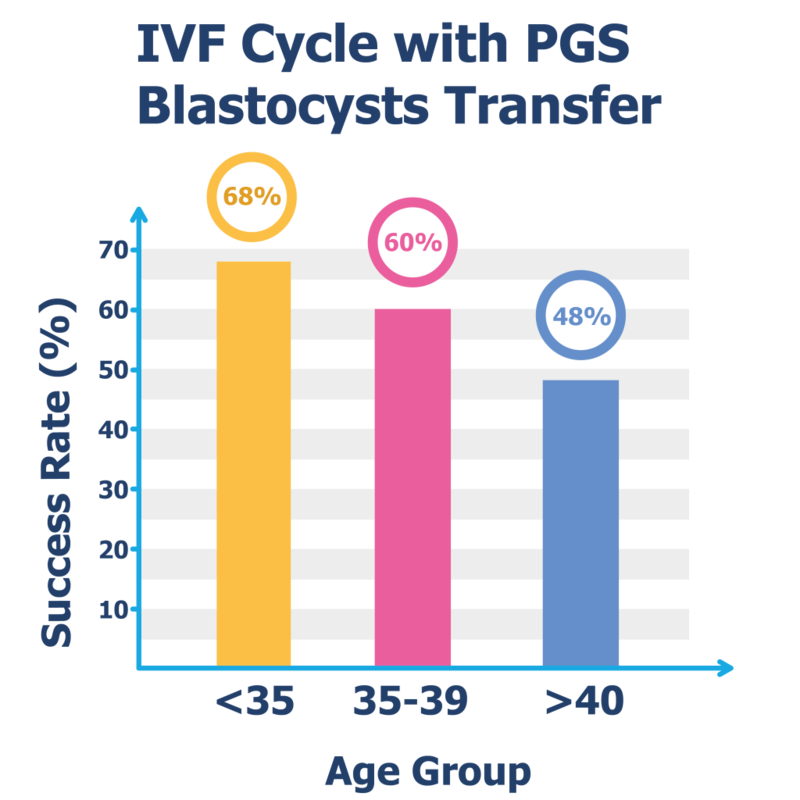 IVF Cycle with Pre-Implantation Genetic Screening (PGS) Blastocyst Transfer means the fertilised eggs, also known as embryos, are cultured to Day 5 (called blastocysts) before being transferred back to the womb. Traditionally, embryos were transferred at Day 2 or 3. Research has proven that biopsy performed at blastocyst stage causes minimum damage to the embryo and thus increases the accuracy of the PGS test. 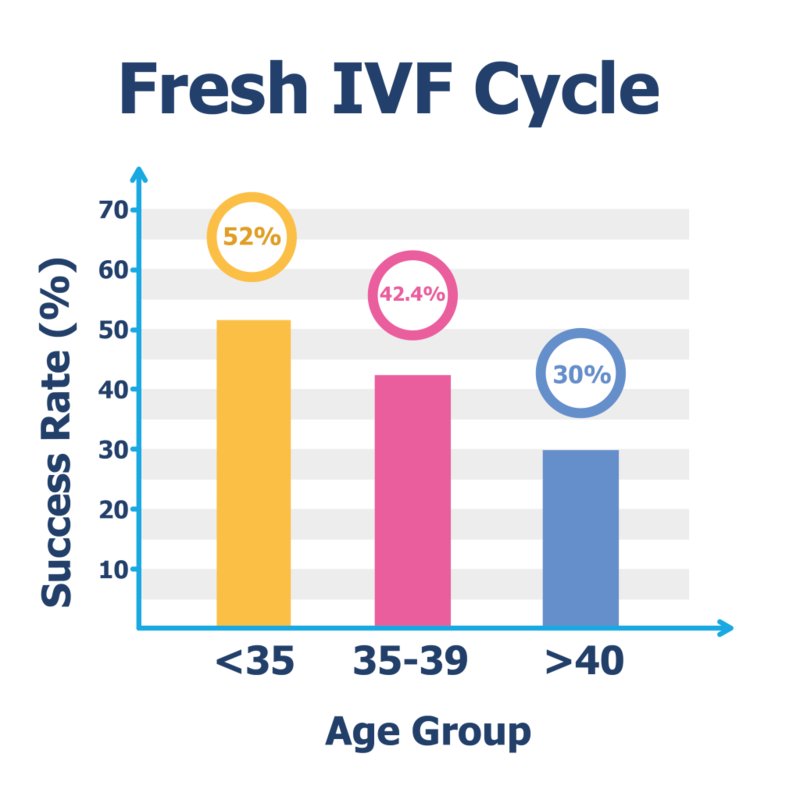 Our statistics show that the success rate for IVF Cycle with PGS Blastocyst Transfer is higher than the Fresh and Freeze-All IVF Cycles.